Your little one has developed enormously during his first year. By now, he’s probably starting to crawl, and may even be close to getting on his feet. He’s also learning about patterns. This means you can be a little more creative in your gift choices. Things that he can push and pull will go down a storm. The same goes for toys that your little one can stack and knock over. Through toys, you provide your one-year old the stimulus that aids his physical and intellectual development. Make the right choices now, and you’ll see your baby develop into a healthy toddler. Now I’d like to share with you some toys that I think run the gamut when it comes to keeping your little one interested. Some of them I discovered through my own toddlers. Others I found through recommendations from other parents. Below is my selection of 20 toys that I’m sure your one-year old boy will fall in love with. If you’re looking for a set of building blocks that can keep your child occupied, this 80-piece Mega Bloks set may be a good option. The huge blocks are easy to handle. They are not likely to get swallowed anytime soon, either. The blocks feature large prongs, which make them easy to assemble and pull apart. Your one-year old will develop some basic motor skills at first. However, the key here is longevity. As your child gets older, he’ll get more creative with the blocks. As a result, this Mega Bloks set might be a great choice if you want a toy that will last for your son’s entire pre-school years. As well as being a good starter pack, this Mega Bloks set is compatible with the company’s long list of other pre-school toys. The building blocks also come with a handy bag, which makes cleaning up a breeze. What's Great About It: The blocks slot together effortlessly, so your one-year old won’t get frustrated easily. The set helps your child develop his motor skills and, later on, his creativity. The bag makes packing up simple, as well as offering portability. The secret to Sassy’s developmental ball is the range of textures used in its design. Each texture gives your child something different to feel and play around with. The huge bumps are easy to grab, while the ball itself is light enough for your youngster to throw around at will. The ball also features some engaging colors and patterns, which could hold your baby’s attention. 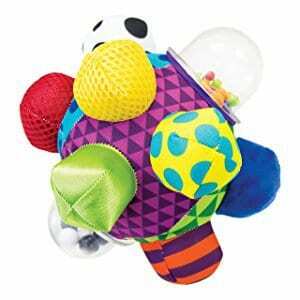 The Bumpy Ball stimulates your child’s hearing as well. Sassy claims that the rattling sound that the ball makes, sparks neural connections in your child’s brain during play. What's Great About It: The Bumpy Ball is a simple toy that stimulates your child’s senses. He’ll feel new materials and see a host of colors and patterns, all in one toy. It also aids in the development of key motor skills, such as limb movement and coordination. Playtime shouldn’t stop when bath time comes. The Nuby Octopus helps you to keep your baby stimulated even while bathing. The toy emulates the classic hoopla game. The octopus floats in the bathwater, and your little one can toss a set of three rings at it. The aim is to get one of the rings over a tentacle, which has the added bonus of developing your baby’s hand-eye coordination. The Nuby Octopus can be fun even for slightly older children, so it’s not going to be a toy that your little boy will outgrow too soon. 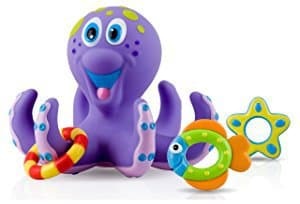 What's Great About It: The Nuby Octopus keeps your baby entertained during baths. Its bold colors catch the eye, and the game itself develops your child’s coordination skills. Also, it’s free of Bisphenol A (BPA). This is good news if you’re worried about the well-known harmful effects of BPA. We all know that little boys like to chew on whatever they can get their hands on. The Vulli Sophie la Girafe is a good toy to chew. It’s made using safe rubber, which is free of BPA and Phthalates. Vulli has also used food paint for the giraffe’s spots. While this means the spots will fade over time, they’re also safe for consumption. The toy is soft and light to the touch and stimulates the senses. It makes a squeaking sound that will keep your baby’s attention. What’s more, the natural rubber that Vulli has used has a distinctive smell. The only minor issue comes with washing. The squeak may get dull if you wash the toy under running water. 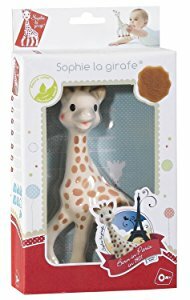 What's Great About It: This toy giraffe looks the part, and has something to stimulate all of your baby’s senses. The healthy design is also a plus. This dump truck is big and bold - your baby will be drawn to it in an instant. It also fulfills your son’s growing desire to grab onto things and stack them together. 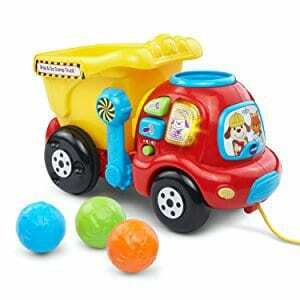 The truck comes with three plastic balls, which your child can grab easily and place into the dump truck’s bucket. This bucket sits on a hinge, which your little one can manipulate to pour the plastic balls out again. The truck also has a handy cord at the front, which your little one can use the pull it along the floor. VTech’s truck also has three buttons at the front. 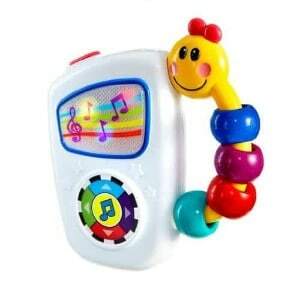 Your little one can push these to hear some funny little songs. The truck even counts along as your child places the balls in the bucket. You’ll need a pair of AAA batteries for this, though, as the ones included with the toy don’t last too long. What's Great About It: This may be one of the best toys for youngsters who have started to walk. The cord at the front of the truck gives your child something to pull, plus the bucket mechanism encourages the development of basic motor skills. I like the Smart Shots toy because it has so much going on. It comes with both a basketball hoop and a soccer net. 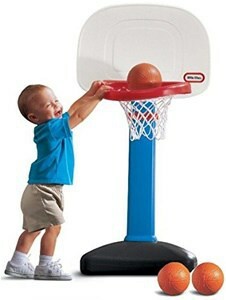 The hoop helps develop your child’s motor skills, while the soccer ball gets your youngster on his feet and kicking. I especially like how there’s more to this toy than meets the eye. Take the LED screen for example. It automatically counts along with every basket your little one scores, which is great for when your child starts learning about numbers. The toy also comes with some extra buttons which play little songs and sounds. While the focus is on movements, this Smart Shots toy could also stimulate your child’s mind. It does need three AA batteries, which unfortunately don’t come with the package. What's Great About It: The Smart Shots toy can make a shy child more active. It’s big and bright, plus it plays over 50 sounds to encourage early learning. 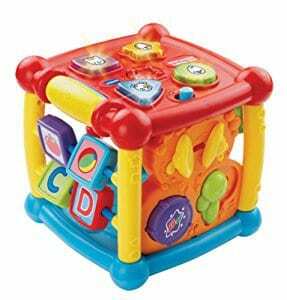 VTech are at it again with another toy that can keep your baby stimulated. Much like the company’s dump truck, this puppy has a cord attached to the front. Your child can pull it along, which activates a bunch of sounds. The puppy’s little legs move, which makes it easier to drag around. The toy plays a selection of 60 sounds, some of which can be activated using the buttons on the toy’s side. Even after the batteries run out, your child can still pull it along. What's Great About It: This is another VTech toy that offers more than what meets the eye. The huge range of sounds that it plays will keep your little one interested. I also like how it reacts to the way the child plays with it. This might be one of the best toys available for teaching a one-year old about animals. It has five sides, each of which offers something a little different to play with. The toy has over a dozen little interactive features, including four buttons that play a host of animal sounds. With this toy, your youngster could develop basic motor skills faster. It also encourages your child to sit up and play. ​Parents will be happy to learn that they can lower the toy’s volume when needed. It’s also free of BPAs. Like VTech’s other toys, it does require a couple of AAA batteries. What's Great About It: There’s a lot going on here, despite the small size of the toy. The various interactive features keep your child engaged, and so do all of the sounds that the toy plays. It requires no set-up, so your little one can just pick it up and play whenever he feels like it. Basketball is a great sport for helping your child to develop motor skills and hand-eye coordination. 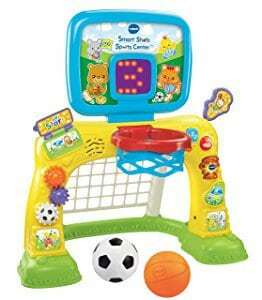 This combined hoop and ball set may be one of the best toys for parents who want their little boys to grow up loving the sport. To make everything easier, it comes with three balls and a hoop with an oversized rim. I especially like how you can adjust the hoop’s height between two and four feet tall. This lends the toy a longevity that you don’t see with most toys for one-year olds. ​Unfortunately, the stand isn’t particularly heavy, so it topples fairly easily. However, you can pour sand into the base to weigh it down. What's Great About It: If you take care of the hoop, it could turn out to be a dependable toy for years. The hoop essentially grows with your child. I also like how it stimulates physical activity by providing just the right amount of challenge. I like this set of six balls as each offers up something unique. They all have different patterns on their surfaces, which will keep your little one intrigued as he plays with them. Having six to a pack doesn’t hurt either. Your youngster can play along with his friends, without any of them feeling left out. 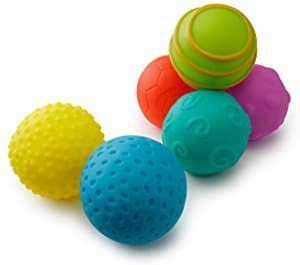 The balls are a good size too, so your child’s grip will get stronger with each play. ​Interestingly, the balls have a secondary purpose. Their soft texture makes them ideal for massaging your baby. You can roll them over your child’s feet, back, and hands to stimulate his sensory awareness. What's Great About It: The different patterns and textures stimulate your child’s senses. Plus, it’s a great choice for group playdates. This toy is great for those long car rides where you need to keep your baby entertained during the journey. It’s light and portable, plus it reacts to how your baby plays with it. The toy can play peek-a-boo using its ears, plus it sings “Do Your Ears Hang Low” whenever your child pushes on the right foot. It’s also easy to wash with a cloth or baby wipe, though you shouldn’t place it in a washing machine. ​The toy comes with a trio of AAA batteries, which are required for the interactive features. However, your baby will love hugging and playing with it, even without the extra bells and whistles. What's Great About It: It’s soft, portable, and sings a little song. What’s not for your baby to love? I particularly like how it plays peek-a-boo, which is a familiar game that I’m sure most of you have played with your youngster. As your baby grows up, he’s going to want to get up on his feet more often. 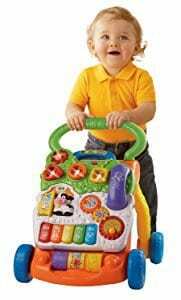 VTech’s walker may be a great choice for aiding your child as he develops his walking skills. The big handle helps your baby support himself as he starts walking on his own. The toy also rolls along smoothly, so your child won’t hit any snags due to the wheels locking up. ​However, it’s the play panel that really impresses. Among other things, it features a little piano and a phone that your child can grab and play with. All told, the toy plays 70 songs and sounds, so it doesn’t get boring for your little one. It does require a couple of AA batteries. You can also remove the play panel for when you want your child to focus on his walking skills. What's Great About It: The play panel offers all of the interactivity that you’ve come to expect from VTech. However, the walker also helps your child to develop physically, making this a good all-in-one toy. Sometimes, simple really is the best, and that’s what you get with this Rock-A-Stack. The toy comes with five rings, each of a different color. They’re big enough yet light, which means your son can grab and explore them at will. 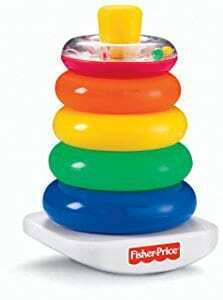 The toy also comes with a stand, which your child can stack the rings onto. This helps your youngster come to grips with the concepts of relativity and size. I can’t describe the feeling of pride that you’ll enjoy when you see your child stack the rings in the correct order for the first time. ​The smallest ring is noteworthy. It rattles when your child plays with it, plus it has a transparent surface. This allows your child to see the little rattle balls bounce around inside. What's Great About It: This toy is simple, but it will help your child develop his motor skills. It also introduces some new concepts to him, plus the rattle ring stimulates hearing. When your child has finished playing, it’s easy to pack, too. 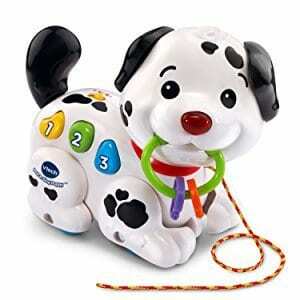 The second pull-along puppy on my list, Hape’s toy offers something a little different to VTech’s. Gone are the interactive elements and sounds. Instead, Hape have kept things simple. This toy keeps your child focused on developing the motor skills that push toys prove so useful for. The wood comes from sustainable sources, so this may be a great choice for environmentally-conscious parents. The finish is also free of any toxic materials. This is important as we all know that most babies like to explore their toys with their mouths as much as their hands. The toy stimulates basic sensory development. I can’t find too much wrong with the toy, though some parents may prefer something a little more visually stimulating. 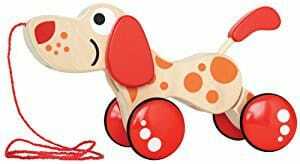 What's Great About It: Hape keeps things nice and simple with their puppy pull toy. Your child will love role-playing with the pup, especially as he gets older. It’s environmentally-friendly, and non-toxic to boot. Standing 12 inches tall, this toy offers your child plenty to grab onto. 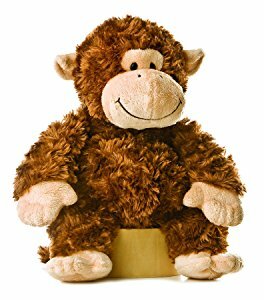 The soft fabric is nice to the touch, so your one-year old will spend a lot of time stroking and hugging the toy. I think this is a great choice for long journeys, as it keeps your child engaged and mostly quiet. Its cuddliness also makes it a nice choice for bedtimes, as it gives your son something soft to keep hold of when you’re out of the room. However, I’m a little wary of the small beads used for the eyes. Even though they’re attached securely, they may present a choking hazard if they become loose. What's Great About It: Your child will enjoy running his hands through the soft “fur”. It’s also a great car toy, plus it gives your baby something to cuddle at night. 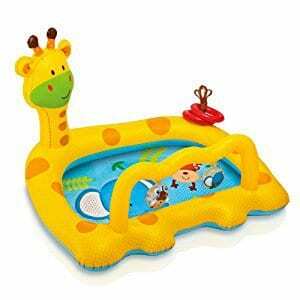 This inflatable pool offers plenty to keep your child engaged while he’s playing. In addition to the smiling giraffe face that watches over your youngster, it has a couple of rings for your baby to grab onto and play with. The pool also comes with a couple of noise-making balls, which dangle from a small arch on the edge of the pool. This stimulates your son’s hearing, while the balls themselves can help develop his motor skills. ​The pool holds 14 gallons of water, and has a wall height of 4 inches. Make sure you’re present at all times while your child plays, though. Remember that children can drown in as little as 2 inches of water, so this isn’t a toy that your baby can play with unsupervised. What's Great About It: It’s easy to inflate, and has a few bells and whistles to keep your child engaged beyond the paddling. It also comes with a handy repair patch, so you can fix it up if it springs a leak. This little playhouse features all sorts of interactive odds and ends. It has 50 sounds, which your child can activate with little actions like flipping a toilet lid or opening an oven door. The playhouse also comes with a pair of figurines, which your child can play with even without the house. Portability is a big plus, too. The house folds in on itself, and has a handle at the top. You can take it on playdates, plus it’s easy to pack away all of the little bits and pieces inside. ​Don’t be put off by the pink roof. The playhouse only comes in one color, but your one-year old boy won’t notice this while he’s playing with all of the interactive elements. Besides, research has shown that children don’t build particular affinities for colors until later on in life. What's Great About It: There are all sorts of interactive features that increase engagement. Also, there are 50 sounds that play depending on what your child does. It’s also portable, and easy to pack away when play time is over. 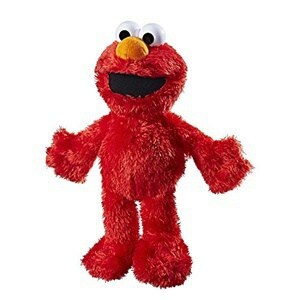 Tickle Me Elmo has been a longtime children’s favorite. It combines the plushness of a cuddly toy with the interactivity that stimulates early childhood development. Elmo reacts differently depending on where your one-year old touches it. A rub of the belly will produce a different sound effect to a little foot tickle. If your youngster keeps tickling him, the laughter gets louder, and he starts to shake. ​There are also a few little phrases thrown in, which will spur your child’s language skills on. It’s also great for cuddling, though you will need to deactivate its noise-making abilities if your child takes a liking to it as a bedtime toy. What's Great About It: Elmo is a classic Sesame Street character. Your one-year old will latch onto the toy if he enjoys the television show. 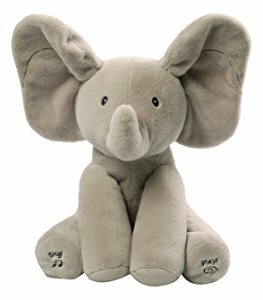 It’s soft and cuddly, plus it makes all sorts of noises that keep your child engaged. 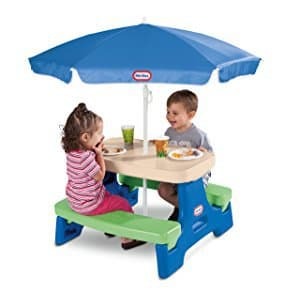 Every child enjoys emulating adults, which is why this picnic table might be a great choice for your one-year old. It’s the perfect size for little legs. It also offers your child a great place to enjoy his meals. I really like the umbrella. It adds a nice touch to the table and it’s ideal when using the table outside. Remember that overexposure to the sun can cause skin and eye damage to young children. The umbrella provides protection from the sun’s ultraviolet rays. The table can seat a maximum of four children. Just be aware of the maximum weight limit of 50 pounds. Though it’s suitable for any child up to the age of five, you may not want four five-year-olds sitting on it. What's Great About It: The umbrella. It’s a good protection against the sun, and it’s pretty and durable too. Also, your child will likely play with this toy long after he’s become a toddler. This penguin toy comes with little suction cups, which keep it attached to the wall tiles in your bathroom. Just pop it on the wall and your one-year old will be drawn to it. The penguin has several slots for different shapes that come with the toy. Your child will learn how to match the shapes to each hole. Better yet, each shape has a number. As a result, your child will learn numeracy skills as he ages. 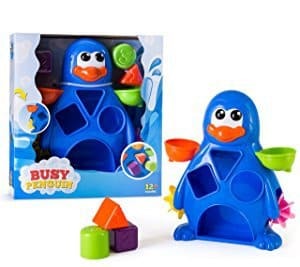 What's Great About It: The Busy Penguin makes bath time both fun and educational. It’s also free of toxic plastics that you don’t want to expose your baby to. You may think that any old toy will do for your baby. But I don’t think that’s the case. A great toy for one-year old boys has to offer something that both stimulates and educates them. Remember that your baby is still discovering the world around him. Anything that introduces a new texture, sound, or shape will aid in his development. 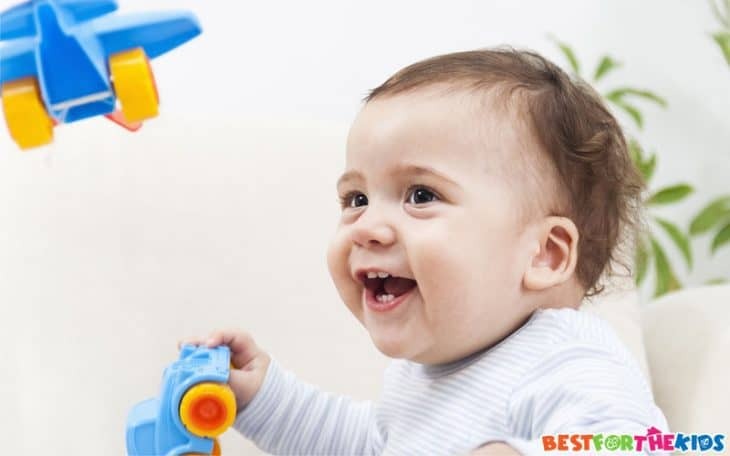 Let’s look at some important features that you should look for in a toy for one-year old boys. Never underestimate the importance of safety when choosing a toy for your little one. Anything that has small parts presents a choking hazard. As a general rule, avoid any toys that have parts that your child can fit into his mouth. Chewing on larger toys is okay. In fact, most one-year olds will explore their toys with their mouths. However, there should be no possibility of the child swallowing whatever goes near his mouth. There’s also the issue of supervision. Any toy that involves water presents a risk. That’s not to say that you shouldn’t buy them. Water play actually benefits your child in several ways. Just don’t make the mistake of leaving your child unattended. Consider asking yourself the following questions before making your purchase. Where will the child play with the toy? Does it need to be portable? Does your child enjoy playing with other children, and is the toy suitable for that? How will the toy aid in the child’s development? Interactive parts that encourage your child to use them. A developmental aspect. This shouldn’t be limited to mental stimulus either. Some of the best toys teach your child motor skills, or help them develop physically. A complete lack of toxic materials. The ability to hold your one-year old’s attention as he gets older. Portability - you should be able to take the toy anywhere. Durability - you want your little one to keep using it for at least a few months or a year before moving on to more sophisticated toys. There’s no denying the importance of toys to your little one’s development. However, I think there’s a science to choosing the right toys. Your one-year old must engage with the toy, else it’s not going to be fun. Anything that offers new sights, sounds, or sensations could be a hit with your little one. A good toy also helps you to bond with your child. Remember that your baby emulates you, and benefits enormously from playing with you. If you enjoy the toy, your child will, too. When choosing a toy, think about what your one-year old really needs. Some toys stimulate physical development, whereas others keep your baby’s mind active. Some just offer something comforting for your child to cling onto and cuddle. Each of the toys on my list provides what your one-year old needs in a toy. However, they all offer something different. Among them I’m sure you’ll find a few that you’d really want to bring home to your baby.